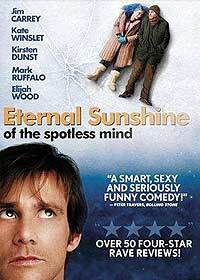 Eternal Sunshine of the Spotless Mind (2004) - Sci-fi-central.com.  USA  2004  108m   Directed by: Michel Gondry.  Starring: Jim Carrey, Kate Winslet, Gerry Robert Byrne, Elijah Wood, Thomas Jay Ryan, Mark Ruffalo, Jane Adams, David Cross, Kirsten Dunst, Tom Wilkinson, Ryan Whitney, Debbon Ayer, Amir Ali Said.  Music by: Jon Brion. Girl gets tired of a declining relationship and has all memory of boyfriend erased. Boyfriend finds out and decides he can't live with that: gets himself erased as well. In the middle of the procedure, which he experiences as a kind of dream, he becomes lucid, realizes what's going on and decides he doesn't want this to happen. But it's too late; despite all his efforts his memory is erased. Fate in the shape of an accidental post- erasure meeting and the other actions of other characters involved twists the plot around and brings them together again. The cast: a director's dream. Jim Carrey, Kate Winslett, Kirsten Dunst, Mark Ruffalo. How can you go wrong? Well, you can, and something did. I've been trying to work out what, because there are so many factors that nuked this movie. First of all what went right: Carrey and the rest of the cast were amazing, even if most of them never got a chance to actually evince what you might call 'depth of character'. Carrey and Winslett do get that chance in the first part, where 'Joel' and 'Clementine' meet again, and those few minutes alone make the movie worth watching; after that it's mostly downhill: the story falls apart in the same way that 'Being John Malkovic' ultimately does, except that here at least the story has somewhere to go, though the writer, director and editor seem to have no idea about how to get there, but ultimately fumble themselves through to an ending. There were some elements with incredible potential: for example the whole dream-like erasure process, with the built-in flashes of lucidity, followed by lapses back into non- awareness. Anybody who's had lucid dreams will recognize the process. Then there's what amounts to a mental chase and battle of wits, as Joel tries to hide his memories in places where the hi-tech backed pursuit cannot find it. The whole thing throws up a whole plethora of troublesome questions related to cognitive research and philosophy, and especially the nature of 'identity'. The suffocating predicament Joel got himself into (by surrendering control of his mind to someone else) and can't get himself our of. The twists and turns of contingency as, despite all this, it all appears to turn out all right. The flaw at the heart of this movie is that someone forgot what story to tell, and instead tried to tell too many, and in the process the movie lost its soul. The editing completed the job that the directing started. It was so VISIBLE as to become detrimental to the actors: in its contrived cleverness it erased much of the depth they could have brought to the characters. Sometimes I had the feeling that there actually WAS something more to this moment or that; but then it usually got zapped, as if the editor was chasing that precious something down like Stan was doing to Joel's memories. The cinematography was trying to be so clever that one could almost touch it. In conjunction with the awful editing, almost every 'cut-to' became a painful jarring of this viewer's attempt to relate to the story and the characters, and made the thing into a cinematographic, rather than an emotional experience. Without this, maybe the other problems of the movie would have been non-existent. I don't know, because the movie is as it is, and we can play 'what if' games forever and speculate into a vacuum. But I'd like to think that maybe in the hands of someone less keen to 'make a movie' and more interested in people and telling a story, we might actually have some emotional understanding of why Joel and Clementine needed to be together, and why it was right that in the end they were. Don't misunderstand me: give me ANY reason for an upbeat ending and I'll embrace it joyfully. So why, in this instance, did I feel that the ending was tacked-on, contrived, artificial? The back-together-despite-all-the-odds simply rings false, if only because the only reason why they are is contingency, sheer dumb luck, twists of fate. They get a second chance and maybe they'll work it out this time. But did they do anything to earn it? In particular, did Clementine, who evinces no sign of actually thinking that there was something wrong with her method to opt out of a situation with the minimum of pain? Do these people actually love each other, and if they do, is that love enough or shown as even indicatively sufficient to bridge the gap they've created in their past and through their actions of surrendering their power of their minds to someone else? Finally, there is something offensive about the general attitude by director and editor towards the actors: in this case a dream-cast, whose potential was mostly edited out of existence. There is a school of film-makers who see actors as a kind of cinematographic element, like a piece of landscape or a prop. As long as they perform the correct motions and say the right things at some time or during some take, there's probably a way to edit it together so that it looks right. That's OK if the actors actually need such treatment. There is another school who believes that actors are to be considered not just essential, but next to the director the dominant visible participants in any decent story-telling process. To demean them into becoming just pieces in a mosaic of self-important film-making is degrading. That Carrey, Winslett and the rest of the cast still manage to shine is a testimony to their professionalism and consummate skill. That aspect was the one truly bright spark in an otherwise disappointing flick. Review by Till Noever from the Internet Movie Database.